Web design, development, mobile apps and strategy. Need help getting a web site or mobile app developed? Websites made easy-to-use on desktop, tablet and mobile with responsive web design. Enjoy greater control over your data with easily set up content management. The right web design for successful e-commerce. Automate processes to make complex tasks simple, and reduce the chances of human error. Harness the power of the cloud to secure your data. Use custom apps to put yourself at your customers’ fingertips. We design and develop web apps and mobile apps that make people's jobs easier, save money and make companies more competitive. Are your employees wasting time and money on repetitive tasks that could be automated? Do you need help with your social media strategy, or social media marketing? We're the small digital agency that delivers big results. By putting your needs first, we're able to make smart, easy-to-use websites and apps that actually work for your business. We're big on innovation, trust and chat. We're less keen on jargon and gimmicks. .
We might be a small web design company in Belfast but we have big clients. 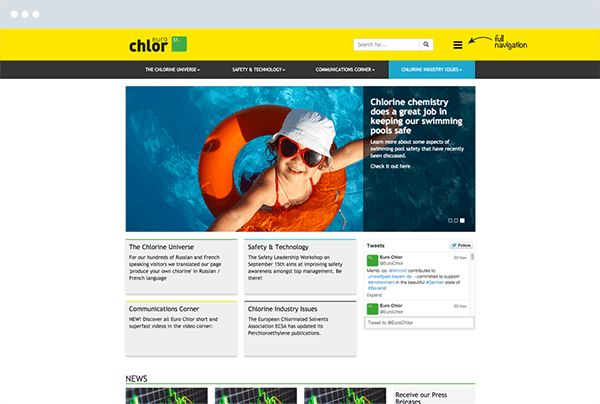 Our latest project was a content management system for EuroChlor, the association of chloralkali process plant operators in Europe, who are based in Brussels. We worked with another agency to who supplied a cracking design for the website. We delivered the front end code and content management system. Umbraco was used for the CMS. EuroChlor loved it that much they wanted to keep it. We hear this a lot from happy clients. The website is fully responsive and looks great on every device, which is a credit to the design agency. At Gumpshen we take a lot of pride in our work and strive to produce quality and value for our clients.